You’ll hold your breath as you read this startling novel set against the backdrop of the 1999 WTO protests in Seattle. 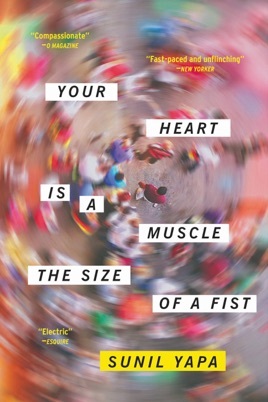 Your Heart Is a Muscle the Size of a Fist introduces us to Victor, a restless runaway and minor drug dealer who just happens to be the stepson of the city’s police chief. Author Sunil Yapa’s jujitsu timing propels the story along, bringing in new, compelling characters and building the tension between the protestors and Seattle law enforcement. We were hooked by the personal stories and the unsettled, frightening edge Yapa captures so well. Yapa's chilling debut is set amid the real-life protests that disrupted the 1999 World Trade Organization Ministerial Conference in Seattle, which resulted in hundreds of arrests, police resignations, and an increased media spotlight on the WTO. The novel follows a fictional group of police officers, dissidents, and a diplomat as they struggle through the summit's first chaotic day, full of tear gas, epiphany, and violence. On one side are the activists and their hangers-on: Victor, a nomadic 19-year-old trying to sell weed to protesters; King and John Henry, veteran nonviolent advocates who arrive at the protests to act as medics; and Charles, a political representative from Sri Lanka who quickly finds himself a target of both protesters and police. Representing the law are Chief Bill Bishop, Victor's estranged stepfather, bent on protecting his city; and officers Tim and Julia, whose past run-ins with terrorism and riots influence their fierce approach to peace. Yapa shows great skill in juggling these seven narratives as he builds a combustible environment, offering brief glimpses of the past to round out each character and in the case of King, to reveal a deadly secret. As the peaceful protests turn brutal, however, the author's firm grasp of his story loosens a bit. But by the novel's end, Yapa regains his stride, resulting in a memorable, pulse-pounding literary experience. That is an overly simplistic heading but meant as the highest praise. Character-driven stories are my favorites, and in this novel Mr. Yapa has created seven people of tremendous complexity. I was hooked from the beginning by his intense and urgent writing; but I appreciated and needed the intermission chapters, as they seemed to give me an opportunity to catch my breath, a luxury his characters don't get. By the characters' actions and inner dialogs, I became privy to every human condition and emotion, from wretchedness to naive hope. I arrived at the end in tears, heartbroken and elated. I would have read this book in one sitting if I could have, but I had to give my own emotions a rest here and there! What a fantastic book, one I'm sure I'll read many times.